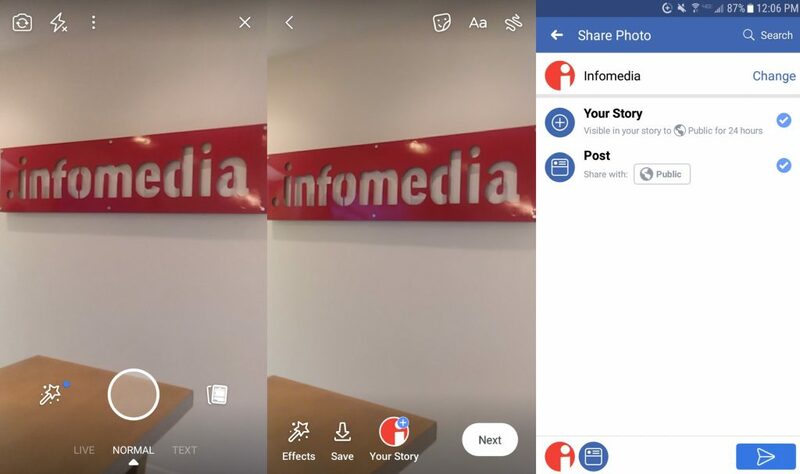 How to Use Facebook Stories for Your Business (and Why You Should) | Infomedia, Inc. Learn how to use Facebook Stories to market your services, promote new products or just keep followers up-to-date on your business. It can be easy sometimes for carefully curated Facebook posts to get lost in the chaos of newsfeeds. There’s no guarantee that all of your followers will see your latest photos or announcements with the social media site’s algorithms changing (what seems like) every day, making it tough to keep up. But what if there were a way to consistently be at the top of every one of your follower’s screens? There is a simple answer: Start using Facebook Stories. If you’re visiting Facebook through a mobile device, there is a section at the top of your newsfeed (seemingly inspired by sites like Instagram or Snapchat) called “Stories.” Inside the stories section are clickable circles featuring pictures of Facebook friends or pages you follow. Once a circle is clicked, whatever that user has posted to their story will play. These posts usually involve short videos, photos with filters on them or announcements about events and offers. All of the posts in Facebook Stories can only be viewed twice and will disappear from the stories section after 24 hours. To take a picture, just click the circle at the bottom of the screen. At the top left, you can change your camera settings to face different directions or have the flash on. To take a video, hold down the circle at the bottom of the screen. You can only film 20 seconds at a time. If you want to add filters, choose them before filming by clicking on the wand button to the left of the circle. To make a text-only image, click on “Text” at the bottom of screen. Type in whatever message you want and then choose a background. You cannot add extras (like emojis or drawings) to text-only images. There’s also the option to post a picture or video that you’ve previously created by clicking on the square icon to the right of the circle. Remember that any lengthy videos will either be automatically shortened to the first 20 seconds if you don’t choose what part to upload with Facebook’s trimmer tool. To edit a Facebook Story: Once you’ve chosen your photo or video, click the “Next” button and you’ll be brought to the editing screen (photo at bottom, center). Here you can add all kinds of extras to your posts to make them stand out. To add emojis and other images, choose the smiley face at the top right. Take note: If you choose the “location” or “event” buttons, they don’t create links to places or event pages; they’re purely for show. You can write text by clicking on the “Aa” button, or write/draw your own creations by clicking on the squiggly lines in the top right. In the bottom left, you can click the wand icon to add frames like hearts or stars. If you’re wanting to save your post to your mobile device, click the “Save” button at the bottom of the screen. To post a Facebook Story: Once you’ve created your image or video with all the bells and whistles you desire, then it’s time to post it! You’ll be brought to a sharing screen (photo at bottom, right) with options to decide exactly where you want your content to go. Always click “Your Story” to put it in the Facebook Story section. If you like your creation enough to want it up for longer than 24 hours, you can also click “Post” which will add it to your business’s Facebook profile like any other regular photo or video post. To see who how many people have viewed your Facebook story, simply click on your business’s picture in the Facebook Stories section and in the bottom left hand corner of each post it will show the numbers. Facebook Stories being at the top of your followers’ newsfeeds is helpful, but just because you’ve got the ideal spot doesn’t mean you can be lax about content. Making helpful or entertaining pictures and videos makes it more likely that users will click on your content next time instead of avoiding it. Take the time to create well-curated and sharp photos that will make your brand’s page stand out. Having good pictures, of everything from your company’s products to events that you’re hosting, will instill confidence in your business. For videos, behind-the-scenes is a popular theme for many pages. It can be something as serious as revealing mock-ups for your next project or as silly as showing the chaos behind the annual Christmas party. Just choose whatever tone works best for your page. If you’re looking to make an announcement and don’t really have any pictures or videos that seem to be a good fit, you can always post a text-only story that highlights your message (and maybe even suggests visiting your website for more details). If you want more help with your social media, Facebook or otherwise, reach out to our website support team and we’ll be happy to set something up.